Most BirdLife Partner countries are parties to biodiversity conventions, but some lack the capacity to implement them at a national level. With Aage V. Jensen Charity Foundation support, six BirdLife partners worked with governments to improve international commitments, resulting in protected status for eight IBAs and plans to create new protected areas in certain countries. The BirdLife Partnership has made significant contributions to shaping international environmental conventions like the Convention on Biological Diversity (CBD) and Ramsar Convention on Wetlands. Most BirdLife Partner countries are parties to these conventions, but some lack capacity to implement them at a national level. With Aage V. Jensen Charity Foundation support, the BirdLife International Secretariat enabled six BirdLife Partners to work with their governments to transform international commitments into effective protection of Important Bird Areas (IBAs). The Partners, Aves & Conservación (Ecuador) and SAVE Brasil, Nature Uganda and BirdLife South Africa, and Bird Conservation Nepal and the Haribon Foundation (the Philippines), had previously focused their conservation efforts on site-level work and grassroots action. But as they were keenly aware, national policy and legislation could advance or undermine their work. By the end of the project, eight IBAs in the six countries had been designated protected areas or private reserves, and a further nine were being considered. All six Partners were involved in national preparations for the tenth Conference of Parties to the CBD in Nagoya, Japan, and several formed part of their national delegations. Four had joined the national committees implementing the Ramsar Convention. 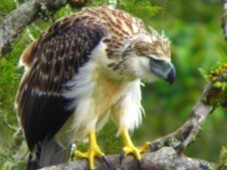 Aves & Conservación is now active in developing the regulatory framework for creating new protected areas (PAs) in Ecuador, and strengthening existing ones. They helped establish local PAs in three IBAs, and are involved in the management of Llanganates National Park and several coastal wetland IBAs. SAVE Brasil’s collaboration with governmental agencies has resulted in official protection of more than 48,000 hectares of Atlantic Forest. During the project, the Brazilian government established three new national parks and one private nature reserve. Bird Conservation Nepal secured government commitment to conserve three IBAs. With these added, Nepal’s PA network now includes 19 sites and covers over 23.3% of Nepal’s land area. Data gathered by Nature Uganda (NU) supported extending the boundary of the Murchison Falls National Park to include the Bugungu and Karuma Wildlife Reserves. Alongside the Wetland Management Department, NU is working to include three Ramsar sites in the national PA system. BirdLife South Africa (BLSA) has been engaged in the declaration of privately owned reserves under the Protected Areas Expansion legislation. This has already resulted in the designation of the KwaMandlangampisi Protected Environment (23,000 hectares), and BLSA is participating in processes to protect three more privately owned IBAs. The Haribon Foundation promotes innovative alternatives to the PA system for managing forest IBAs in the Philippines. During the project, Haribon was closely involved in the revision of national forest policy and legislation. At the close of the project an online portal was established to share information about global environmental policy actions across the BirdLife Partnership. Pridham, C. and Langley N. (2013) Living landscapes for nature and people. Celebrating the conservation work of the Aage V. Jensen Charity Foundation and the BirdLife Partnership. Cambridge, UK: BirdLife International. Pg. 62-63. What do the National Reports to the Convention for Biological Diversity tell us?